If you have a dog that was special, and would like to tell us, please send a paragraph telling about how your experience as an owner made a difference – both the dog’s life and yours. Include a couple of pictures as well. As we get stories and pictures, we will add them to this page. If your dog was an Aztec rescue dog, thank you for giving this dog a second chance. Buddy II will be remembered as the shy dog that just wouldn’t stay at home. As a 6 month old puppy, Buddy was found wandering around the hills of Temecula and reluctantly gave in when approached by a good samaritan. Buddy was young and energetic and loved to run. He was nicknamed “Rocket”. He spent some time in a foster home, and more time at the kennels where he became the best friend of all the daycare dogs. He was one of their favorite playmates. Still, it was apparent that Buddy needed some personal attention with people, so he went to a foster home in Big Bear. He came back to San Diego and was right at home again at Greywood kennels. Buddy still needing to get over his shyness of humans, was on his way to his new foster and (and hopefully adoptive) home, when he scaled a vine covered wall and took off. He was pursued by Aztec’s rescue team, the adoptive owner, and even two of his best human friends, Madge and Beta from Greywood kennels, who brought along one of Buddy’s dog friends, Lilly. Nothing worked. Buddy had a great time keeping away from his human pursuers. He would hide until found, then casually trot away when they got too close. This went on all afternoon and late into the day. Buddy was determined not to get caught, and was having a great time roaming around and playing his version of keep-away. It was getting late, and the rescuers gave up for the day, ready with plans for the morning. For Buddy, that was the best day of his life. The next morning, before he was captured, he was hit by a car and died on the spot. Buddy’s only problem was that he was shy to a fault. He befriended other animals and even little kids. And as much as everyone tried to work with him, and keep him from harm, it just wasn’t possible. He will be missed by everyone that has met him. Cody came after I got Windsor. Montwoods Ford Windsor. Parents were Top Gun and Morning Coffee. I saw Cody, this beautiful red, just like Windsor. I called Angie about him and she said, that Cody went home with another family. I was bummed out. As things happen, got a call from Angie a week later letting me know that the Family could not keep him and the next day I went down and picked him up. 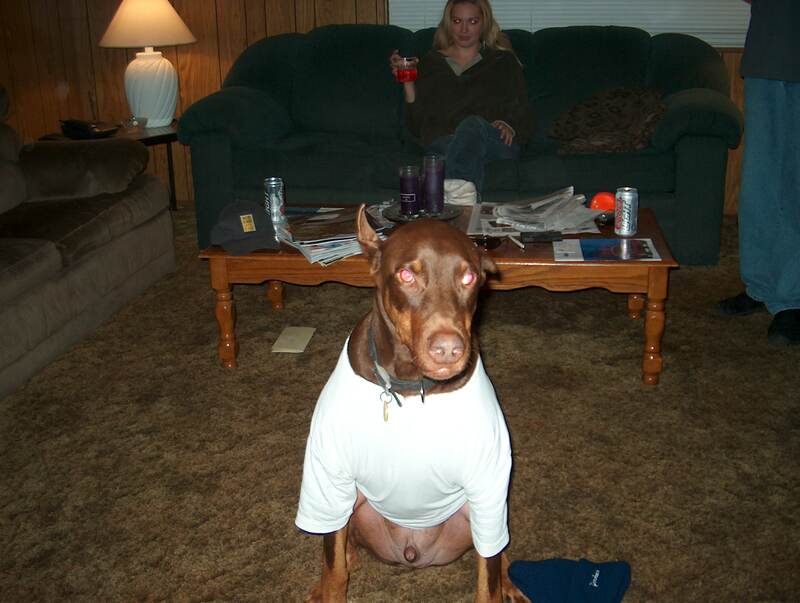 What a joy to have another Doberman again. Especially a red. When I got Cody he was almost 2 years old. I brought him home not even knowing if he was housebroken. He slept at the bottom of my bed on the floor, luck to my surprise, he was housebroken already. He became my shadow in life, going everywhere with me. I taught him the basic commands, and wow what a quick learner. When I got him, Angie told me he was abused and not fed in the past. That was going to be tough to get through and it took time to build his trust, but we did. I was able to take a bone away and he was fine. Through the years that I had him, he brought so much joy to my life. He learned all the basic commands and beyond. Never running when the door opened, always waited for food and the command to eat. He never went into the kitchen, and most of all was there for me at all times. At the end after his 6th birthday, I got up in the morning to find that he could not get up. His left side was ballooned up and he just could not move. I had to call a friend to help me take him to the vets. Got him there and doctor came out and said that there was nothing that they could do, and the best thing was to put him down. I sat there with him until the end. That was one of the hardest things to ever go through. 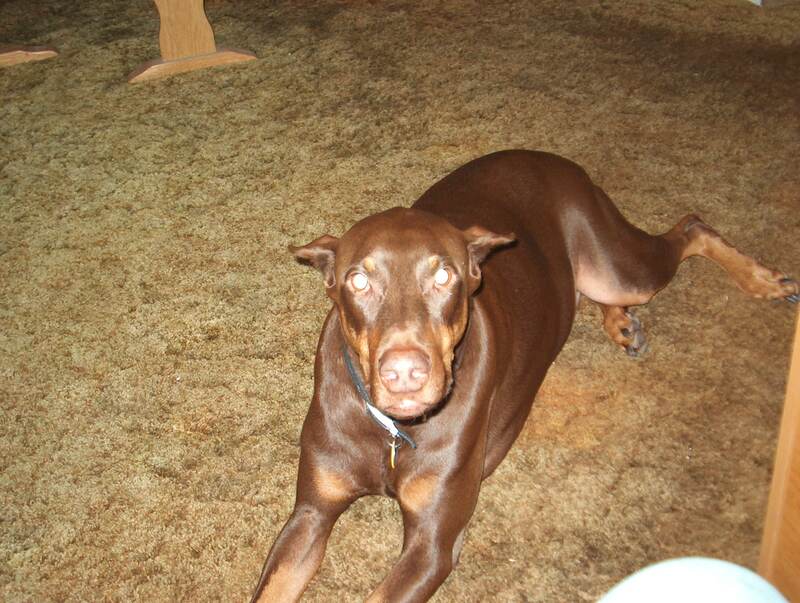 Six months later I got my current dog, Lincoln, at Aztec Doberman Rescue. Once again he went home with another family, and again got that call from Angie, saying he’s back. Mojo passed away before going to a new home. Mojo was the star of the Aztec booth at a recent Pet Expo because of his social personality. He was so willing to move in for a good lean and hug, and the Expo visitors giving him plenty of opportunities to do so. On Saturday night after the Expo ended, Mojo was rushed to the emergency room where he was diagnosed as having bloat, a situation where the stomach flips over and strangles the digestive system. It was too late, and everyone at Aztec rescue said their goodbyes and Mojo quietly passed. It was a sad end to a really great day for Mojo. Bloat is reputed to be the second leading cause of death behind cancer in dogs. For more information about this condition click here. Harry was found as a stray wandering around Chula Vista. A good samaritan saw the condition he was in and just had to help him. Despite the obvious neglect, he wagged his stubby tail, showing his perpetually friendly personality. While at Aztec, Harry showed some real improvement, regaining his health and hoping for a new and final home. He was always willing to show his happiness when he saw people and no matter what kind of life he may have suffered, Harry only gave out affection in return. On the day before his adoption showing, Harry spent the day happily playing with the daycare dogs, got a bath to look good for his debut, and went to bed with his cookie. Harry passed away in his sleep that night, March 9, 2012. He never got to go to a new home, but his final days were filled with happy times thanks to the help from the staff at Greywood kennels. Vinny was found wandering the streets of Los Angeles, and was was taken to Aztec, where Angie took care of him, gave him a pen with a mountain of blankets, and they waited together for us to arrive. After prancing around a dusty paddock looking at us with his best “please let me be your man” look, we all knew. He hopped in the back of our car, posed for a picture, and our journey began. He wasn’t easy at the beginning, still wary from life on the street, but he captured our hearts, and we his. He moved to Hawaii and then on to Ohio, and he had a long, great life full of love from many. He always was our sweet boy, always finding a hand for a face rub or an ear scratch, always living in the now. He had a magic run. The world lost a small spark this week. Submitted March , 2012. – Kay Towers and Bruce Stevenson. Buddy came to Aztec as a 9 month puppy along with his litter mate Daphne. Both Buddy and Daphne were abused terrified when they arrived, being fearful of people, and needing a home that could help them get over their trauma. Michael and Zuzana were so taken with Buddy that they drove down from Vancouver BC to adopt Buddy. He went to a wonderful home and had the best care. But, in early January he developed a genetic kidney disease and succumbed to kidney failure at 18 months of age. Buddy was one of Aztec’s favorite puppies. Submitted January, 2012. 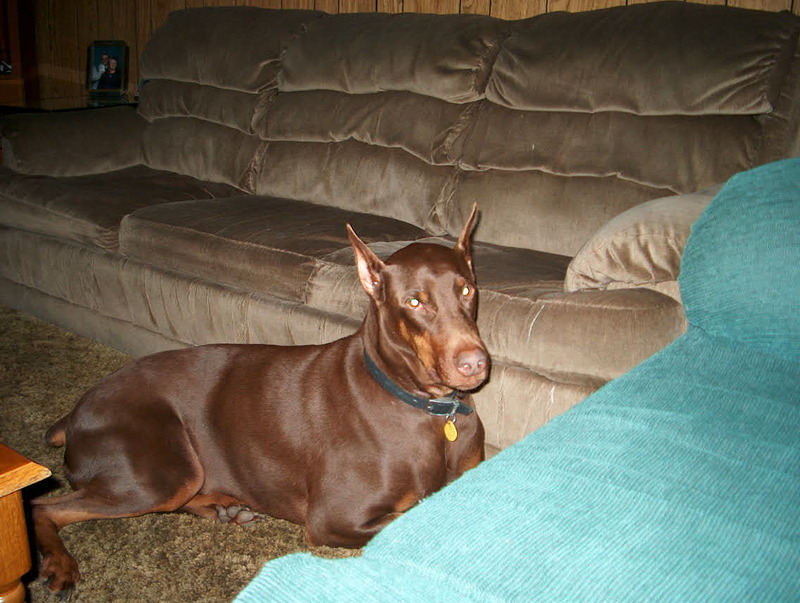 – Aztec Doberman Rescue committee.